Though Messiah Baptist Church in the Maryville community of Georgetown is fairly new, the building housing the congregation is over a century old. The sanctuary’s first congregation was founded in 1842 as the Episcopal Church of the Messiah, and members worshiped in a nearby preexisting chapel. 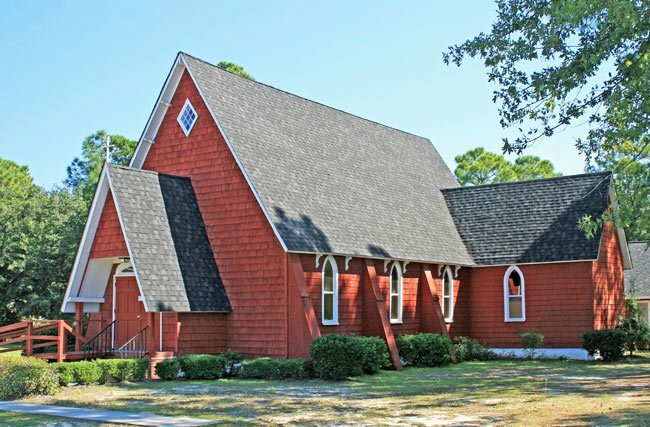 The Episcopal congregation was able to build its own church along the North Santee River in 1853, which served the church until it burned in 1886. The below church replaced the burned church and was completed in 1900. Yet at the time the church was rebuilt, membership was dwindling, as the end of the rice industry following the Civil War drove people to town centers to look for more economical ways of life. By 1909 the church was dormant. The church was disassembled in 1955 and moved to its current location in Maryville, rebuilt, and used again until 1961. At that time the church using the building also shuttered, and the Carpenter Gothic church building once again sat vacant. In 1979 the church’s current congregation, Messiah Baptist Church, was established in the former Episcopal church sanctuary and remains active today. Some of the info is incorrect. This building sat on the Corner of Donham Avenue in Georgetown in the 1960s. It housed the Nazarene Church. Chonda Pierce, a popular Christian comedienne, was the daughter of the pastor in the mid-1960s.